Ha, brilliant! Is it wrong that I still want to see this? To be fair, I’ll be waiting for the DVD. lol i actually loved this movie, mostly for eva green and lena headey. and i will not tolerate a kristen stewart comparison lol! yeah the slave references (and the black face) was kinda odd to watch and took me out of it for a bit, but i was genrally really engrossed. Haha, just because I poke fun at it doesn’t mean that I didn’t enjoy! 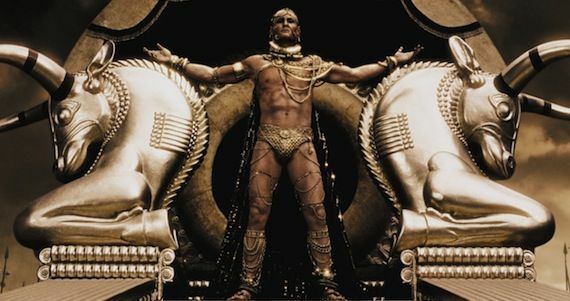 There is something completely engrossing about this movie and 300. Probably because it isn’t a run-of-the-mill action movie. I’m only halfway through this film, but I still read your list ’cause there isn’t much to spoil anyways. Good points on what I’ve seen so far :-). I’m watching the version with Dutch subs and every time I saw the name Themistocles pop up on screen, my brain would scramble it into Thesticles ha ha. Perhaps my subconscious was just trying to spice up his character, ’cause the dude is blaaaaand. And all that slo-mo is getting tiring, I bet it made the movie at least 25% longer. Which is one way to add volume if there isn’t enough content. Well, let’s see if I can make it to the end without falling asleep. I actually did quite enjoy the first movie and am now wondering if it had as much slo-mo (and why it didn’t bug me back then). Cheers, thanks for the laughs!